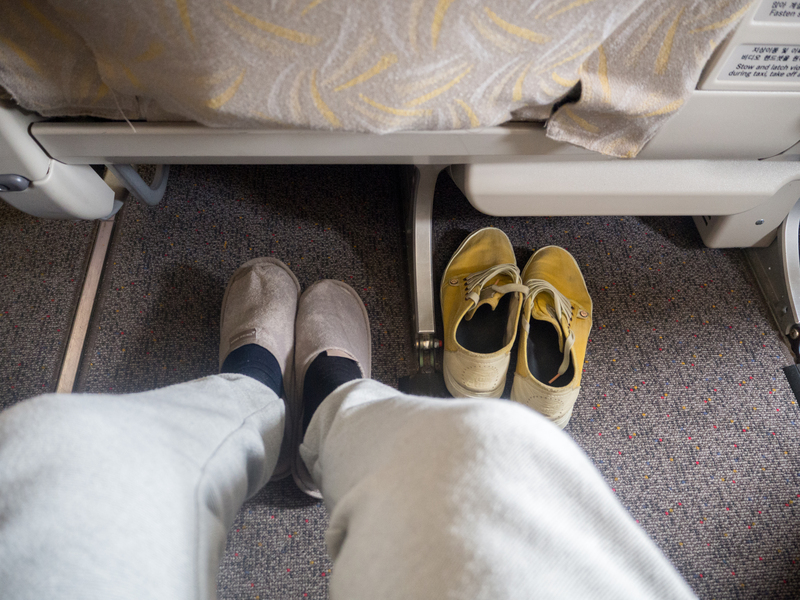 One thing I’ve always wanted to do is to travel long haul in style and having saved a fair bit of money during the last school year, I decided to splash out on a business class flight on my journey back from Tokyo to England. I’m not sure what this says about my priorities, but the fact it cost more than flights from London to Jakarta, Jakarta to Sydney and Sydney to Tokyo combined should tell you all you need to know! 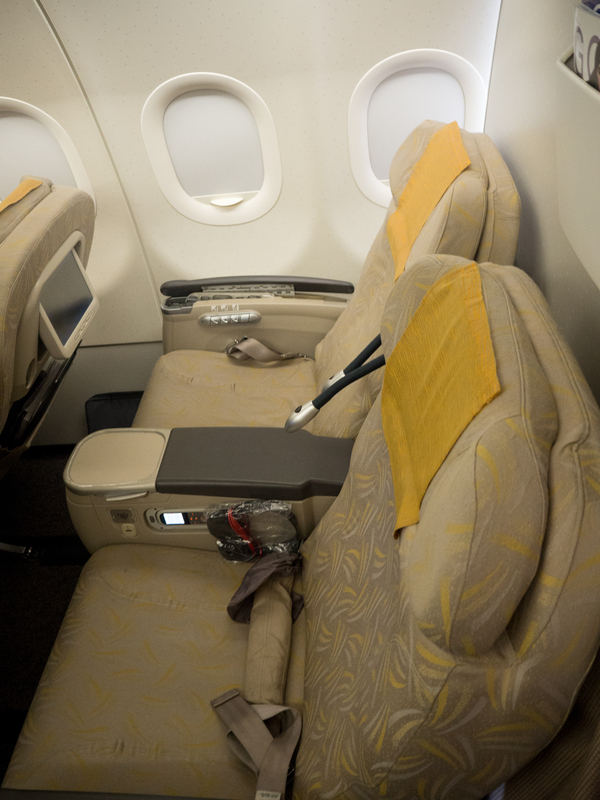 The business class cabin of Asiana Airlines’ A321-200. 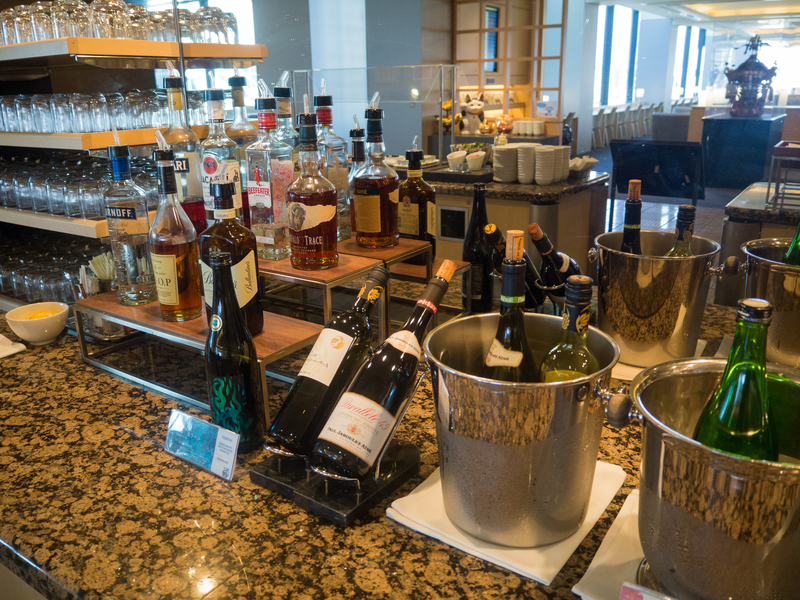 Having flown out of Tokyo’s Narita airport a few times before, I knew what to expect. To be honest, it made a nice change not having to walk the arduous trek from terminal 2 to terminal 3 in the summer heat! No idea why I wanted to fly business class. Nope, none at all. A little presumptuous I thought so I replied with the snarkiest “yeah” possible and moved on. I can only assume this was something to do with the fact I was wearing joggers and a t-shirt and not a shirt and trousers, as she didn’t seem to take exception to anyone else who joined the line! 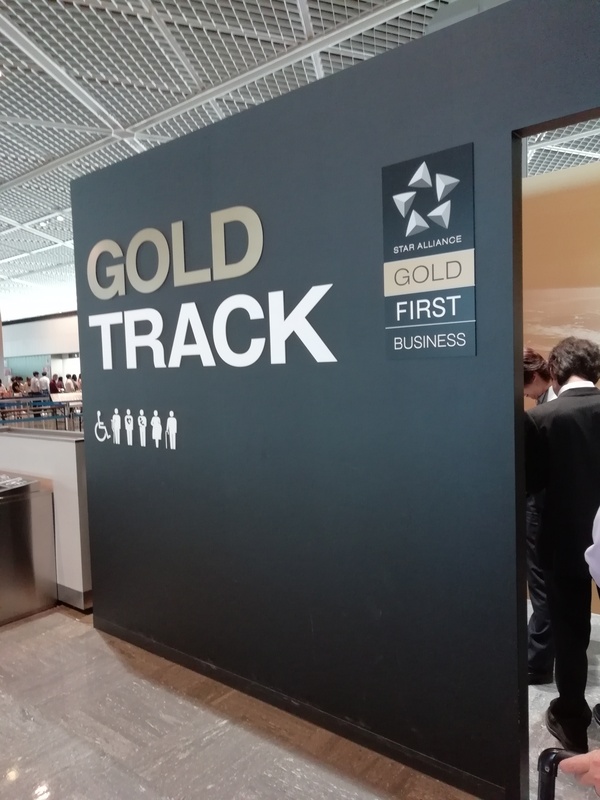 Check-in done it was time to skip yet another queue as I joined the Star Alliance Gold Track line for security. One of the most time-consuming things at Narita airport is often the security queue so it was a nice treat to be through in five minutes or so! An absolute godsend having seen the queues for normal security! With about an hour until my flight I decided to make good use of the free lounges available for business and first class passengers. 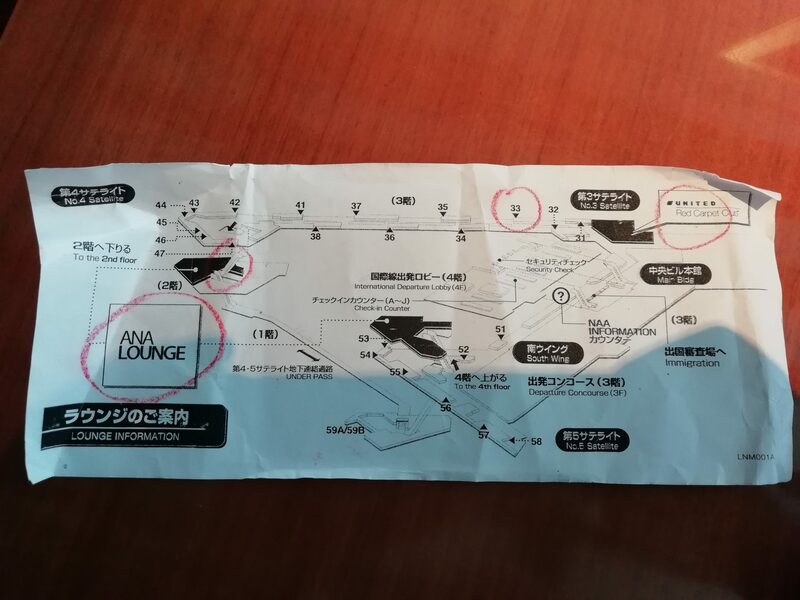 I was given a piece of paper by the check-in attendant with a map of the gates and lounges. My choices were the United Red Carpet lounge and the ANA Lounge and I opted for the former out of pure convenience as it was near enough next to my gate. The first thing I noticed was just how empty it was! It’s a huge lounge with a capacity for a good few hundred people but I’d be surprised if there were more than 30 people in there when I was. I dumped my bag as far away from any people as I possibly could and set about checking out the food on offer. Take your pick part two! There was the standard lounge fare (pastries, salad bar, yoghurt) as well as sushi and runny scrambled eggs and sausages. If I learnt one thing from my two years in Japan it’s that sausages are just never as good abroad as they are at home! There was a woman in there absolutely filling her boots which was nice to see. Go on lass. 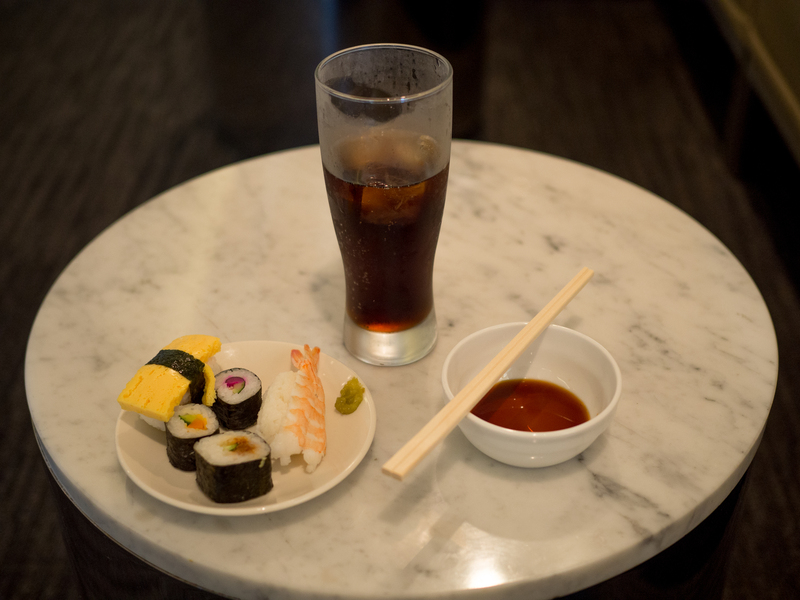 I satisfied some last minute cravings for sushi (you never know when you’re gonna get it again) but managed to avoid the extensive free-flowing alcohol in favour of orange juice, Coca Cola and coffee as it was still only 8am! The first of many meals on this particular day! 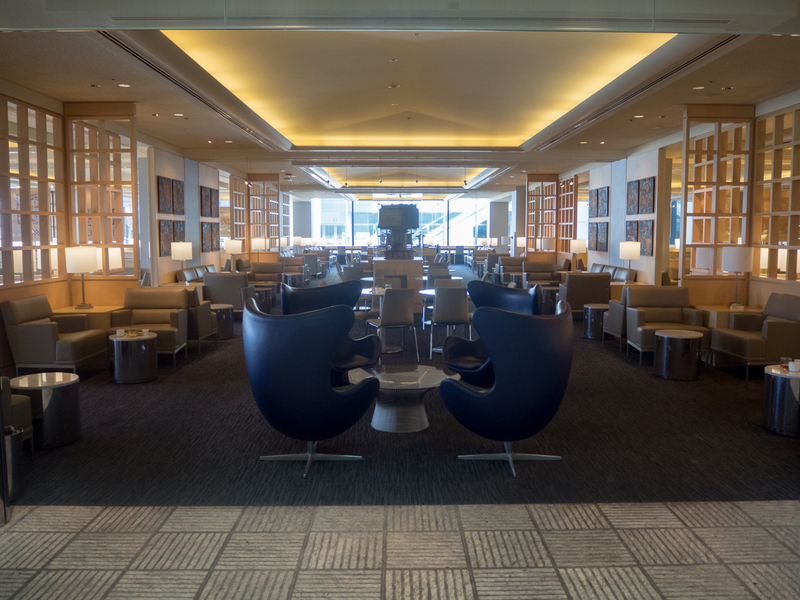 Speedy boarding – yet another perk of flying business class. Will I ever be able to take a normal flight again? Seeing as I was only the third person on the plane I got nice and comfortable in my seat as the rest of the passengers filed in. As an aside, I noticed that the guy next to me was wearing tracksuit bottoms and Nike trainers. I wonder if he got the same treatment as I did at check-in. 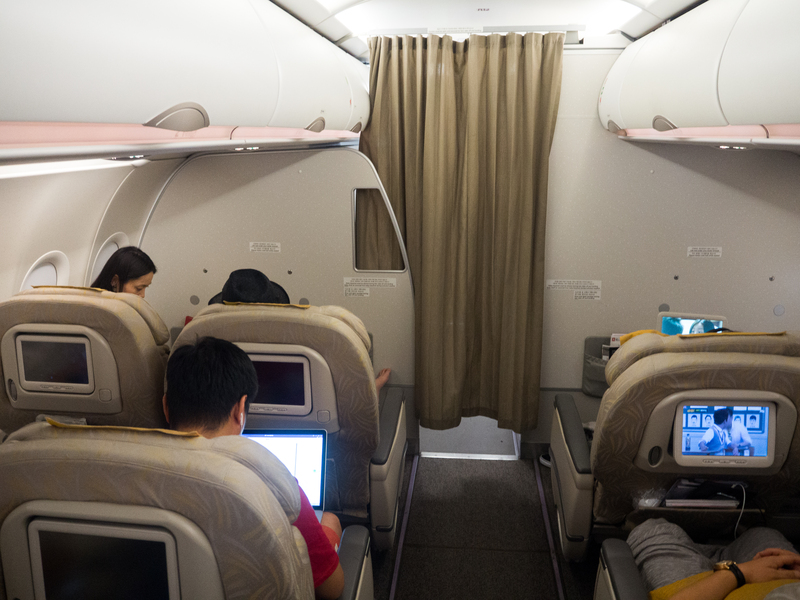 There are only 12 business class seats in a two-by-two set up on these particular planes, and they’re nice and spacious with plenty of legroom. Not that I often need extra legroom, but it’s still nice to have the option! There’s also a substantial armrest in the middle of the seats, so there’s none of that ‘who gets the middle armrest?’ awkwardness. Wonderful comfort, not so wonderful style. Other extras included nice padded headphones for the in-flight entertainment, a USB charging point and a pair of slippers! As someone who often takes their shoes off when flying and can never be bothered to put them back on to go to the toilet, these were an extremely nice surprise! On the topic of in-flight entertainment, there was a wide selection of Hollywood and international films, as well as the standard 10 episodes or so of The Big Bang Theory and NCIS. This may go some way towards explaining why I’m writing this post on the flight instead of making use of the screen currently in front of me. Just look at all that legroom! Once everyone had boarded the cabin crew came round and offered us a glass of water or orange juice, and as soon as we were airborne the menus were out for the onboard meal. 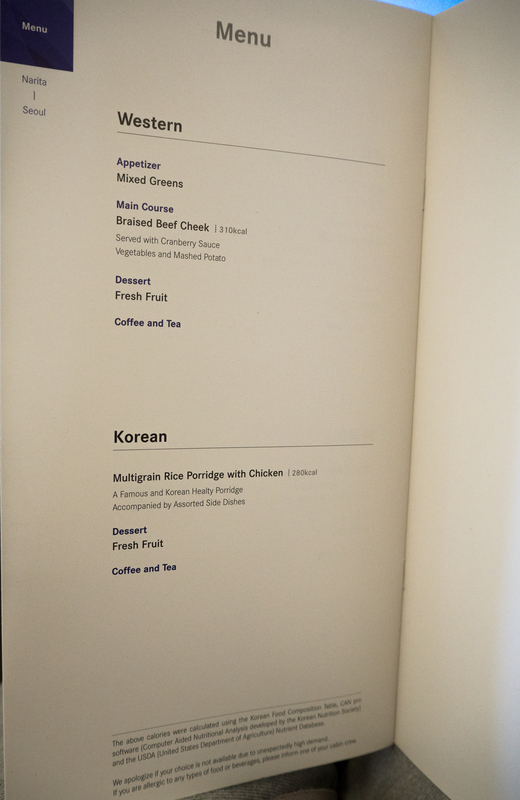 There was a choice of a western beef cheek meal, or a Korean porridge with chicken. Beef cheek in the morning. Why not? I actually thought the beef sounded a bit heavy for half nine in the morning so opted for the porridge, only to be told (very apologetically, I may add) that the guy next to me had just ordered the last one. 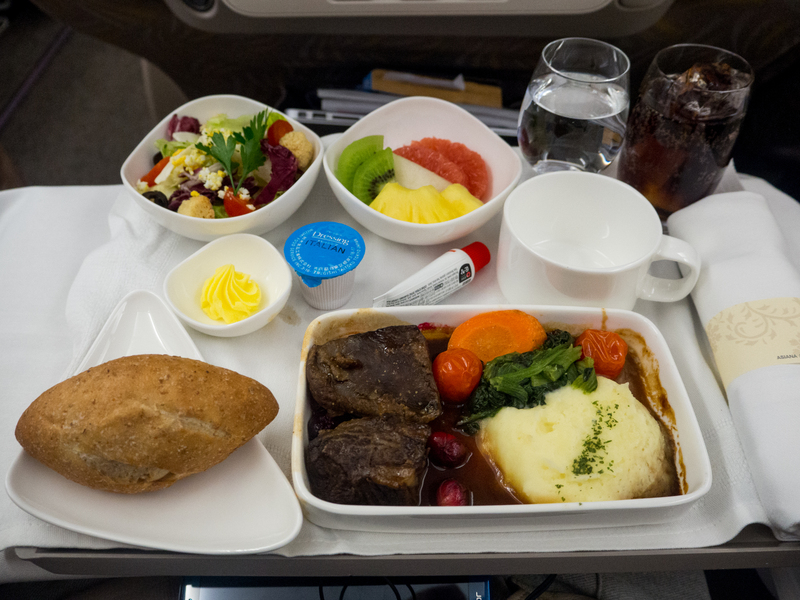 Word of warning – don’t choose the back row of the cabin if you’re a fussy eater! The food arrived almost instantaneously with your drink of choice, and I was quickly over the disappointment when the beef pretty much fell apart at the touch of the knife. Absolute winner and the best airline food I’ve ever had. The tube of spicy Korean paste also added to it, although I’m not sure my guts would agree. Some of the most tender beef I’ve ever eaten! As it was only a two hour flight, aside from tea and coffee this was pretty much the end of the onboard service. I spent the rest of the flight reading a book, writing this review and going to the toilet multiple times thanks to the free drinks. The toilets themselves were standard airline bathrooms, with the addition of toiletries such as combs and toothbrushes. 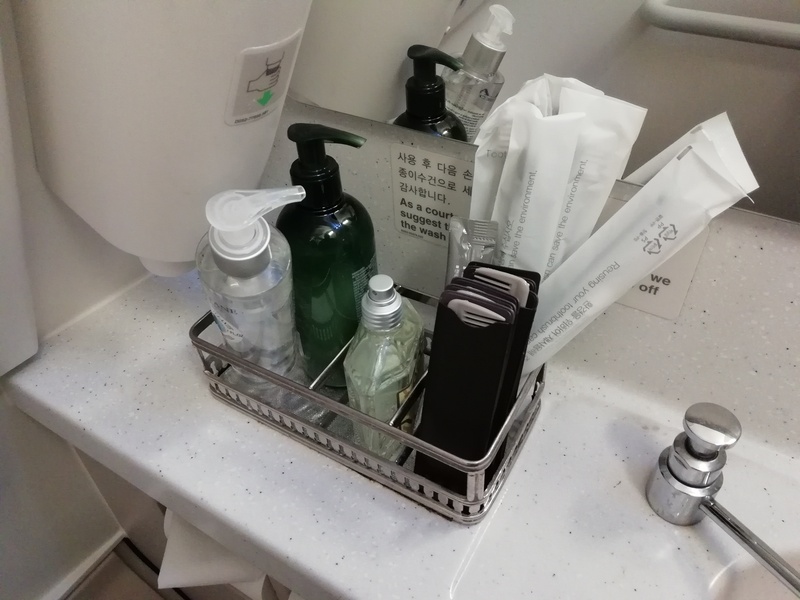 It seemed a little excessive for such a short flight, but maybe I’m just bitter that I can’t find a use for the comb! Perhaps a little excessive for a two hour flight but no complaints here! As we were landing in Seoul the cabin crew handed back jackets to the other passengers (which I hadn’t even seen get taken in!) before personally thanking each and every business class passenger for flying with Asiana, and wishing those who were transiting a safe onward journey.